Ride reports from members, mostly of club runs but all stories welcome. Five riders met at the Quad, what was a beautiful sunny morning. Margaret lead the ride with our first cafe stop at Denstone. Now refuelled, we then made our way through Ellastone, Stanton, Cauldon, Stanshope towards Ilam. We sat outside for lunch and witnessed the stunning views overlooking the gardens and hall looking towards Dovedale. (see photos) It was well worth the wait after climbing all those hills! In all we clocked well over 60 miles as we got back into Derby. A glorious day out, thanks Margaret. Sunny ride to Shackerstone Station. Yes, it was sunny. We headed out through Botany Bay and Linton Heath to join the cycleway from Swains Park to Spring Cottage. There are some quaint names around this part and the pink house and pink car at Linton Heath are even quainter. We left the trail at the National Forest Youth Hostel to avoid the muddy section and a short section of road took us to the morning stop at The Hub cafe in the Courtyard at Moira Furnace. With a bit of time on hand we took to the dry trails of Donisthorpe Woodlands and although it may have seemed we were going round in circles we didn’t actually. We emerged to drop down to the lakes created by mining subsidence at Oakthorpe then continued through Measham and Snarestone to Shackerstone Station. Some were sitting outside but we chose the cosy interior with its Victorian memorabilia and log and coal fire. Apart from weekends the tea room is also open on Wednesdays if you fancy a mid week visit. The station was quiet with no trains running but that didn’t detract from the day. It is a charming example of a country branch line station. I gave the club a chioce as to a direct route back or a quieter, longer route but there was no clear decision (or any decision) so I opted for the lanes with a few items to see and admire on the way back . These were the Sir John Moore School at Appleby Magna (a rather grand building and based on a design by Sir Christopher Wren), the Manor House at Austrey and the duck pond and cottages at Newton Regis. From there we returned through Seckington and by the daffodil filled churchyard at Lullington. We started out from the Quad (without Timmy) after a misty start to the day, en route to Spondon via the cycle path alongside the A52. Various detours are in place caused by the improvements to the carriageway around the Wyvern. Discovering we had lost two after crossing the Wyvern footbridge, our visitor Rui sprinted back to find that disaster had struck early for Mary with a rear tyre slashed by a shard of glass. Not a problem usually until it was discovered that that her Schrader valve pump was incompatible with the Presta valve inner tube. First timer and legend Melvin saved the day by changing the tube and offering the loan of an appropriate pump. It was starting to get warmer as we passed the gate to Locko Park (no quagmires for us today) through Stanley and ascend to West Hallam. A fast descent to Straws Bridge to pick up the Nutbrook Trail where Melvin was enquiring naively if we had finished the “moderately hilly” part of the ride. Ever the master of understatement I replied, “there is just a bit more”. The sun was starting to appear and the trail was fulfilling it’s description of a multiuser path. Walkers, runners, horses, mothers and cyclists all happily intermingled enjoying the fresh air and the absence of cars. The Nutbrook Coffee Shop looked busy as we passed without stopping after the delay with our earlier “technical”. Through the now abandoned car parks of the once thriving American Adventure Theme Park, we reached the Ilkeston Road where Rui was to depart for his return to Derby. Rui is Portugese (as in Rui da Costa 2013 World Professional Road Race champion) and came to the UK as an exchange veterinary student 15 years ago and stayed! He was riding a Bianchi race bike(10/10 for that) and was on the big ring for the whole ride. Happy memories! Four remained now as we sped down Long Lane into the Erewash valley with thoughts of the not too distant lunch stop helping to forget the climb up to the “attractive (?) birthplace” of the controversial Victorian writer, D H Lawrence. It was a relief to get through the town as traffic was very heavy but we were soon travelling up the pleasant valley road to our lunch destination. The rough approach track has been surfaced (a major improvement) and inside the tearooms, it was wall to wall with Mums. We had been allocated the annexe room but found it colder in there than out so we dined alfresco in 10.45? in warm sunshine watching the rare breed chickens playfully frolicking in a nearby field (more euphemism!). Wendy had joined us for lunch at Beauvale. She was on a recovery ride in her car after Three Fields ie to recover me as we had planned to visit Belper around teatime for one on Adrian Farmer’s excellent local history talks. The remaining three had been primed with the details of the return route via the Erewash Canal path and with Sara’s OS map to the fore, they departed for home. So CTC DaB, iou 50% ride lead. Disappointing not to ride back as it was a very pleasant afternoon but that’s the busyness of retirement. Next stop Montenegro! Nine intrepid cyclists plus me left the Quad heading along the riverside path towards our first park at Alvaston. The work of the lumberjacks was in evidence here as many mature trees had been felled and others well pruned. Out of the park and up Raynesway heading towards Spondon and our second park, West Park. The academy was named after this one and all that remains to evidence its existence is the stone gateway and one gate at the end of Park Road by the thatched cottage. Heading north, we were off to visit our third park and excitement was mounting to see a quagmire. Arriving at Locko Park we unanimously agreed to try it out encouraged by one of the group who walked it recently and said “it wasn’t too bad”. Our bikes were ditched by the time we reached the road to West Hallam. When questioned about this situation we discovered the “it wasn’t too bad” person bribes her partner to clean her bike by ironing a shirt or two so no wonder she wasn’t bothered by her mud splattered bike. Pah! Continuing northwards, we headed off up Station Road, Stanley aiming for Mapperley and, you’ve guessed it our fourth park, Shipley Park. Catastrophe! Shipley Lodge cafe was closed for re-furbishment. Luckily we had a choice of two alternatives and chose the Visitor Centre. Much improved and the cherry & almond scones (with jam butter AND clotted cream) are recommended. Refuelled we retraced our wheel tracks to Bell Lane and up to Smalley, up to Horsley Woodhouse and hurtled down to Kilburn. Straight across at the lights and a gentle ride to the Spotted Calf at Holbrook with me missing the panoramic views to the east as I was concentrating on my front wheel and hoping the defibrillator in the village was working (only joking I felt ok). Mrs “it wasn’t too bad” left us here as she had no lights & a fair distance home, so nine of us enjoyed a cuppa at the community café. A fast descent to Coxbench and Little Eaton and back into town on NCN 54, the apology for a cycle path. One more delight awaited the remnants of the group as we rode along Haslams Lane. A surprise FIFTH PARK! Darley Park. I arrived home with 35 miles on the clock after a lovely sociable outing on an unusually mild and sunny day for January. In October the Burton Group went to the Wirksworth Stardisc, an intriguing site high on the hill above the town. Leader Glen Corcoran had kindly given us some hill climbing practice beforehand on our route from coffee at the Flower Cafe at Ashbourne Market Place. Not that we have many hilly rides and it was worth it for the views and the descents. It was an easy start on the Tissington Trail to Tissington, then down to the ford and the climbs through Bradbourne and Bradbourne to roll along the tops to Wirksworth. The Stardisc is up a little lane from the Market Place and what a surprise this quaint part of the town is with the jumble of stone cottages lining the road. A local recommended taking the left fork for the lesser of the climbs. Once up, there are views all round from the quarry behind to Alport Height across the Ecclesbourne valley in which the town lies. I mentioned before that the Stardisc is a celestial amphitheatre and 21st Century stone circle. It has astronomical line-ups including sunrises at the various times of year if you want to get up there a bit early. In the circle is a depiction of the stars and we found all the constellations of the Zodiac after Steve Bloor wanted to find his. Lunch was taken in the cafe carriage at Wirksworth Station and we were made most welcome by the preserved railway volunteers. It was a stiff climb out of the town but what a view over the length of a shimmering Carsington Water, a section of road not done for some time. Return was through the lanes of Hulland Ward and Brailsford. 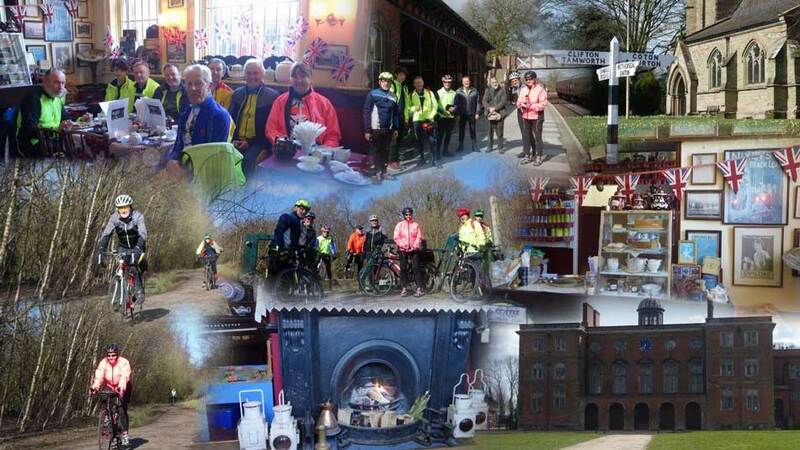 Seven riders left Doveridge Post Office café on Thursday for a lovely autumnal ride to Froghall Wharf. Despite the breezy and occasionally threatening weather we (mostly) stayed dry and waterproofs were not required. This undulating ride along country lanes and quiet roads gave us some stunning views over the Staffordshire valleys. Excitement built up when we inadvertently started herding a group of cows along a single-track road. Fortunately a motorist took over the cowherd role and we followed on behind until the cows decided to explore a gate into a field and we were able to pass safely. The long downhill into Froghall was much appreciated, as was the excellent lunch at Hetty’s teashop, next to the wharf and impressive old limekilns. The café was very busy and we were lucky to get a table. The return route initially retraced our steps –the disco hit “The Only Way is Up” certainly applies to Froghall, and can be hummed on the hill out if you have the breath! We returned to Doveridge via Oakamoor, the Churnet Valley road and Croxden Abbey with Martin and Roman splitting off in Rocester to return more directly home. The afternoon tea stop back at Doveridge was enjoyed by the remaining 5 riders and enabled us to miss a passing shower. 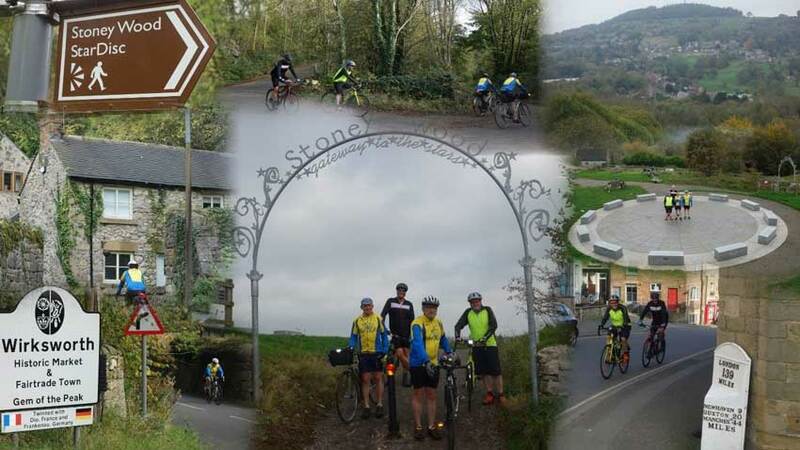 The official ride was 32 miles and approximately 2300 feet of climb, but everybody added to this total by using public transport, parking away from the village or cycling from home. Ah well onwards & downwards. 14 descended Lodge Lane at speed (bad luck for the hardy souls who had staggered up earlier) and then off at a more sedate pace towards Mercaston. The quiet lanes took us on a switchback route through Moorend to the A52. Very busy today and it took us a while to cross with the volume of traffic. Safely over, we passed through the picturesque village of Osmaston and on to Wyaston Lane (NCN68) to descend Dobbinhorse Lane. Momentarily joining the A515 and then across cross the verge into the back lane leading to Clifton. Taking a left turn at the crossroads we followed the road along the beautiful valley of the River Dove with the Weaver Hills on the horizon to Norbury, over the Dove and through to Lower Ellastone. If we had thought the route had been hilly so far, wait until we turned off the B5032 for Marlpit Lane. There was much crunching as the lowest gears were meshed to attack the initial ramp. The OS map shows the lane gains around 60m in less than a kilometre. Somewhat misleading, as there are a couple of “false flats” in there. We reached the top (eventually) and took the road signposted to Farley. I’ve never been to Alton Towers but can imagine the rides are based (but not as pretty) on the road through Wootton Park. We arrived by the main entrance to the “attraction” and with the thought of lunch in mind, the quickest route to our destination was taken – the exhilarating descent into Alton. The kph on the Garmin were a blur but concentration on the road was required especially on that very “sketchy” left hander where the road surface felt just like a “rocky road”. Turning into Red Road, we meandered in dappled sunlight alongside the gurgling Churnet. Our lunch stop reached in a kilometre. The sun was really warm when off the shaded road, so we dined al fresco, some under a canopy, others out in the bright light. Rumour is that the café could be closing with the retirement of the proprietor. Hopefully not, for it is a gem. The stiff climb out of the valley held no attraction after a hearty meal so the planned exit was along the Churnet Valley path. Oh dear, a bit squelchy for anyone putting a foot down but the leader had said ”hopefully dry” so complaints fell on deaf ears. Out of the mire at Denstone Station, we moved on through Rocester, passing another of Arkwright’s Mill by the Dove bridge. The plan had been to head towards Marston Montgomery but too early a right turn saw us visiting the delights of Abbotsholme School. No point in lingering as Rosemary was still holidaying in Norfolk. A quick retrace and we were back en route for Doveridge and onto our tea stop at Sudbury Courtyard café. Excellent tea, coffee, cake and “to die for” ice cream. All with 10% discount for cyclists. RESULT! Energy replenished, we were off back to Derby by our various routes. A lovely ride in late summer sunshine. I recorded 99.9kms door to door (but resisted the temptation to increase it!) so the 65miles proved a reasonable estimate. 12 riders met at Park Farms, also Dave W who come to give us encouragement for the hills ahead! The hills arrived early as we climbed Nether Lane to Hazlewood. The downhill through Farnah Green was exhilarating but only a small respite before climbing up Dally Lane and Gorses, before the downhill to Whatstandwell. Rider leader unpopularity increased as we headed up Leashaw Lane to Holloway. With a few more ups and downs we arrived at Dethick Chapel for a cultural interlude. It is a super place to visit for the medieval church and the amazing views. A strong headwind caused slow progress to our lunch spot of Riber View cafe ( no view of Riber from here) We were met at the cafe by Rosemary, so 13 of us enjoyed sunshine and a good lunch. The afternoon saw us visit Riber Castle before dropping ( seriously quickly) to Starkholmes. A short stretch along the canal path lead to our final challenge of Holly Lane, returning to Duffield for well earned tea and cakes at Movie Shakers. The group split here. We had a super sunny day with some challenging headwind. We did 56 miles and just over 3800feet of climb. The joint Derby and Burton ride this Sunday is a visit to Wirksworth and the newly refurbished National Stone Discovery centre to go back 300 million years in time! Entry to the centre is free, finance is by visitor donations. The Burton Group start is 8.30am at Abbey Arcade by Market Place, High Street, Burton to meet the Derby group at Meynall Langley Garden Centre. The cafe opens at 10am, starting from there after 10.30am. A ride led by Glen Corcoran which will be 55 to 60 miles from Burton. 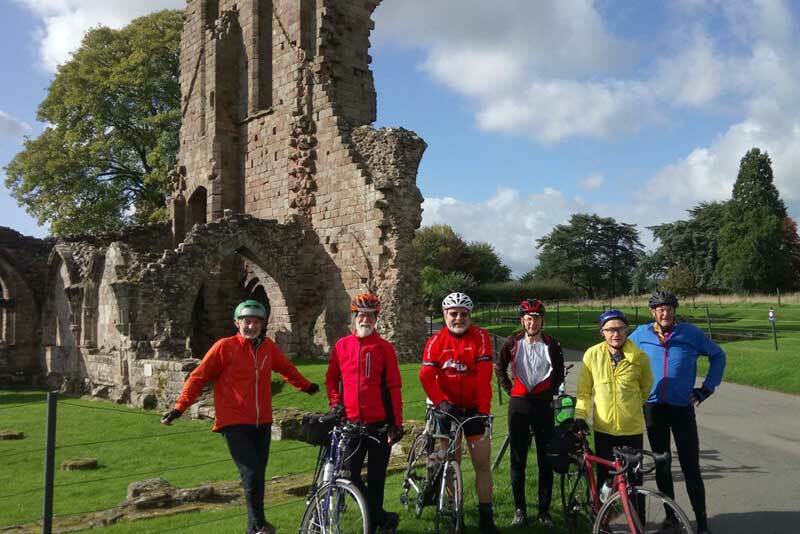 It was a beautiful sunny day for Alan Cooper’s Burton ride last Sunday to All Saints’ Church at Sheepy Magna. The churchwarden gave an interesting guided tour. The main features were the fine stained glass windows, the Saxon Cross and the incised stone where arrows were sharpened. It was then a short ride for a picnic lunch at Orton on the Hill before returning home. It was a very relaxing start at the World Peace Cafe at the Tara Centre, Etwall for last Sunday’s joint Derby and Burton ride. Eleven riders were out. Glen’s morning route took us through Longford and Alkmonton on the way to Ashbourne. The cycle route dropped us into town and through the tunnel to the end of the Tissington Trail. However, to avoid the muddy and busy bottom part of the trail, we climbed up to Thorpe with time to see the views over Thorpe Cloud. 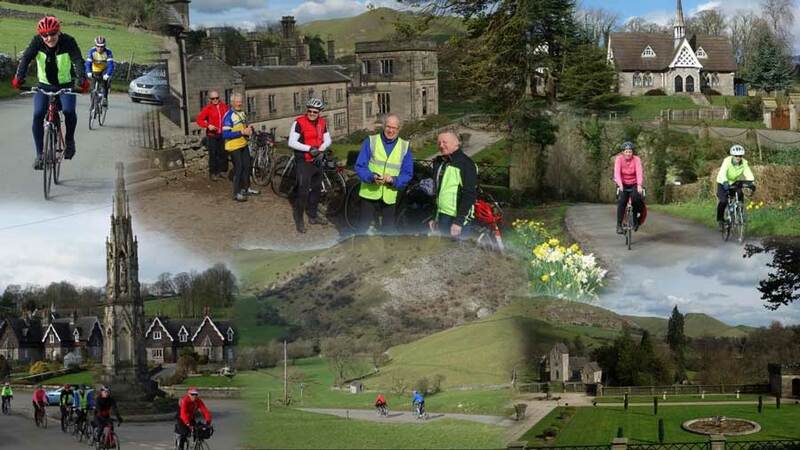 The descent took us to the entrance of Dovedale and into Ilam village and to the Manifold Tea Rooms at Ilam Hall. It was a joy to be able to sit outside after the winter rides, especially with the views over the village and hills beyond. We knew what was coming, every way out of Ilam involves a lengthy climb. Glen took us the one up to Blore then down to Okeover for a ride through the park to Mayfield. 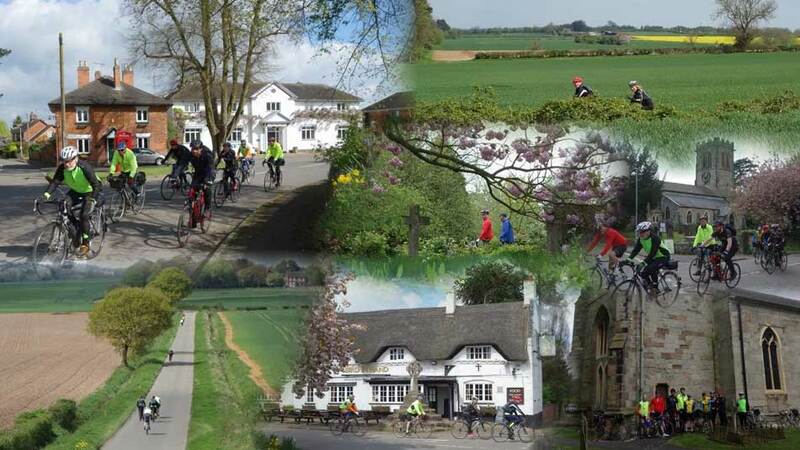 We then deviated from the usual route to take in Snelston and Roston Common and the other usual route from Marston Montgomery to Boylestone and Church Broughton where the Derby and Burton riders went their separate ways home. A cracking day awheel. There are few villages around in which the traffic is so light that nothing moves in a quarter of an hour. Snelston is one of those for most of the time and is off the beaten track, so to speak, nestling in a valley off from the River Dove to the south west of Ashbourne. The Burton group paid a visit yesterday. Terry Williams had promised a cafe new to the group so with intrigue we headed out to Tutbury and onto Draycott in the Clay. A short stretch of the A515 brought us into Sudbury and the cafe was revealed. On the left just before Sudbury Hall and set back is Sweet Little Cafe. It has a modern feel in one of the converted barns set around a courtyard. Service and the food was good. Tea for two is excellent value. If you have cake and get sticky fingers you can always go to the adjacent Stcky Fingers shop. We then took the old A50 to Doveridge to turn north into the quiet winding lane to Norbury with views of the Weaver Hills to our left. The next section following the River Dove was a delight, so serene and peaceful. We turned off up a short single track road into Snelston passing a multitude of Snowdrops. First stop was by the war memorial where Terry told us about Snelston Hall. It had features copied from Alton Towers and from the pictures it would have made a splendid National Trust property but sadly, due to dereliction, it was demolished in 1952. The paradox is that the loss of the house has meant that the village remains a quiet place. We then set off up the village street and passed some lovely Estate cottages and houses up to the Hall gatehouse. More chat. It was then a short hop by way of Clifton to Fairways Garden Centre cafe on the A515 for lunch. The return followed the time honoured way of Dobbin Horse lane and once up there it was gradually downward to the Dove valley by way of Alkmonton and Hatton and then home. Brrr…, that was Sunday but well worth getting out. 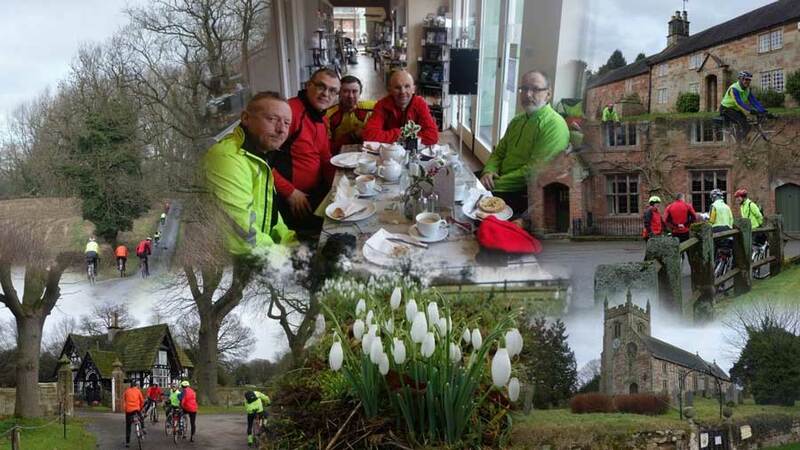 The Burton ride passed Sudbury Hall and took the delightful lane past Bowling Alley to Marston Montgomery and Rocester. The lake at JCB was frozen at the edges with birds standing atop. The car park at Denstone Farm Shop cafe was as full as ever and when we reached the counter all the tables had been taken. This was a stroke of luck since we bagged the settees in front of the log burner. Gloves and hat were warmed up in front as well as us. We resisted the urge to put more logs in the burner. We then climbed out from the Dove valley through the quiet backwater of Stubwood to join Long Lane. We turned at Hollington down the winding narrow lane to Stramshall and on to Uttoxeter. First call was the Market Place and the Millenium monument. The main features were the plaques to famous local firms and the representation of the solar system. There’s a lot of information on the Public Monuments and Sculptor Association website and I should have looked at it beforehand to grasp a bit more of what the monument represented. 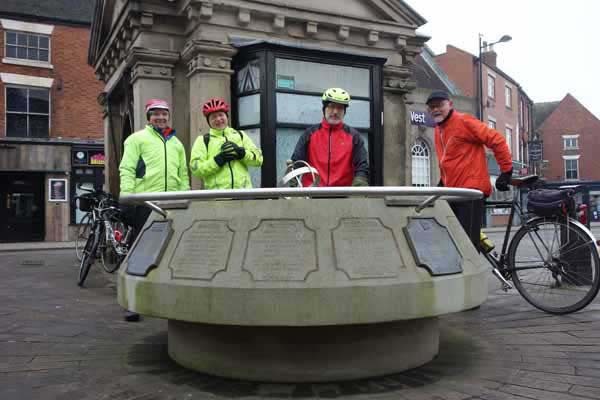 ” This circular monument records Uttoxeter’s history and achievements in a series of inscriptions around the edge of the stonework. There is a time capsule inside containing examples of products from the town’s chief industries and work by local schoolchildren. On top of the stonework, a circular brass panel divided into four quadrants shows a heliocentric view of the planets, frozen in the position which they were in as the country passed into the year 2000. This is 2m in diameter, with each millimetre representing one year since the birth of Christ. The four points of the compass are shown in aluminium around the edge.The sun is shown within an armillary sphere at the centre. This functions as a sundial, with the pin in the centre pointing to the Pole Star and casting a shadow on the ring, which depicts local time in Uttoxeter”. I must go back when it is sunny. Tesco’s cafe was full so we decided to head back home. This was by way of Marchington, Fauld and Tutbury. The temperature didn’t rise above 3 degrees all day. To cap it all – at Uttoxeter a solo cyclist appeared and was telling us about all the expensive thermal garb he was wearing and how warm he was. £15 for a pair of socks? He’s missing the joys of hot aches.